Is swimming in contact lenses safe? Discover the potential risks of wearing contacts in water and the best contact lenses for watersports. Do you swim in your contacts? Did you know that it's possible to contract a painful eye infection from wearing contacts in water, one that could even lead to blindness? I've always worn swim goggles when swimming in my contact lenses or I've made sure that my head was always above water. Why? Well, it seems obvious to me that the lens could move when "floating" in water or that chlorine from a swimming pool could irritate my eyes. But did you know that a bacteria called Acanthamoeba can attach itself to your cornea as a result of swimming in contacts, causing a condition known as Acanthamoeba keratitis? There is less risk if you swim in the open ocean or a clean, well chlorinated swimming pool (but NOT a hot tub commonly found in spas), but highly risky if you swim or do watersports in or on a lake or river - areas likely to contain stagnant water. For that reason you should not wear contacts while swimming underwater in a river or lake especially or really in any type of water, pool or the sea, using prescription goggles if you want to see clearly instead. If you have to wear contacts, my advice is to ONLY use daily disposable soft lenses that are discarded after your activities, thereby reducing the risk of any eye infection. While swimming in contact lenses underwater presents certain risks for contact lens wearers, most watersports take place ABOVE or ON the water; so it's ok to wear contact lenses for watersports like water-skiing or wake-boarding right? Tip: Remember that unless you're a total expert who NEVER falls in, you are highly likely to get a face-full of water doing these types of sports, usually with your eyes wide open! So you do need to be careful. My best advice, having worn my 1-2 weekly lenses for water-skiing, had many face-plants (!) in the sea and even lost a lens in the ocean, is that you should wear a daily disposable lens for watersports OR a pair of prescription swim goggles. 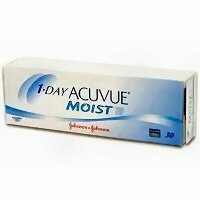 I now wear this ultra comfortable lens - Acuvue Moist, a daily disposable contact lens manufactured by Johnson & Johnson. They block up to 82% UV-A and 97% UV-B rays and have the highest UV protection available in a daily disposable contact lens so are great for watersports in the hot Cyprus sun. Just pop in a fresh pair every day for maximum comfort and convenience. You are bound to get salty deposits from the sea on the lenses OR potentially risky bacteria if you ski on a lake, so the best way to avoid any eye infection or irritation is to throw the lenses away at the end of the day. In short, if you need vision correction by swimming in contact lenses wearing ordinary goggles or for high adrenaline watersports, Acuvue Moist daily disposables could be the most comfortable contact lenses for you.